Wagner's campaign said the threat is not literal. Wolf's camp said the video shows Wagner is "unhinged and unfit for office." 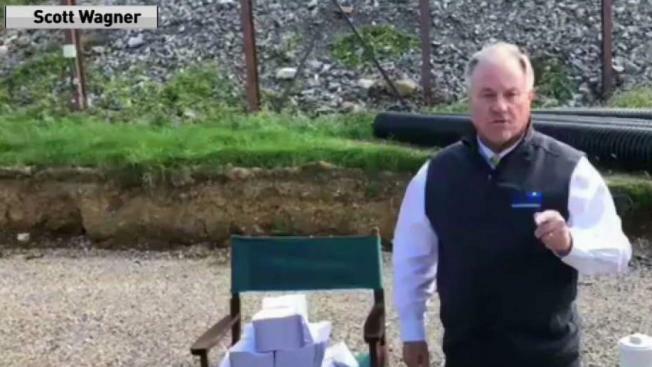 Two weeks ago, Republican gubernatorial candidate Scott Wagner went outside the boundaries of political decorum by calling Gov. Tom Wolf a "gutless coward" for Wolf's refusal to participate in more than one debate. But instead of pumping the brakes, Wagner hit the gas: On Oct. 12 in a social media video, the GOP challenger trailing badly in recent polls threatened the incumbent Democrat with golf spikes. Yes, golf spikes. The sport of baseball didn't escape unscathed either. "Between now and Nov. 6, you better put a catcher’s mask on your face," Wagner said along the side of a road in his home base of York County in a Facebook Live post. "Because I’m going to stomp all over your face with golf spikes. Because I’m going to win this." Hours later, Wagner took the old one down. "I may have chosen a poor metaphor. I may have had a poor choice of words. I shouldn’t have said what I said," Wagner said in the replacement post. A spokesman for Wagner said hours after the video posted that the stomping is not to be taken literally. "He wanted them to be a metaphor for how he will approach the final stretch of the campaign," campaign spokesman Andrew Romeo said in an email. "Tom Wolf has spent the entire race hiding behind false and negative attack ads like a coward instead of debating in front of the people of Pennsylvania and Scott will spend the last month of the race making it clear to voters why they should not give him a second term." Wolf's camp said the video shows Wagner is "unhinged and unfit for office."